The Neo-Pure 501 and 502 Series Non Air Gap Faucets are a stylish and well-made addition to any kitchen. For use with your under the counter water filtration system, these faucets are available in polished chrome and brushed nickel, offering easy to use dispensing for fresh tasting, filtered drinking water. 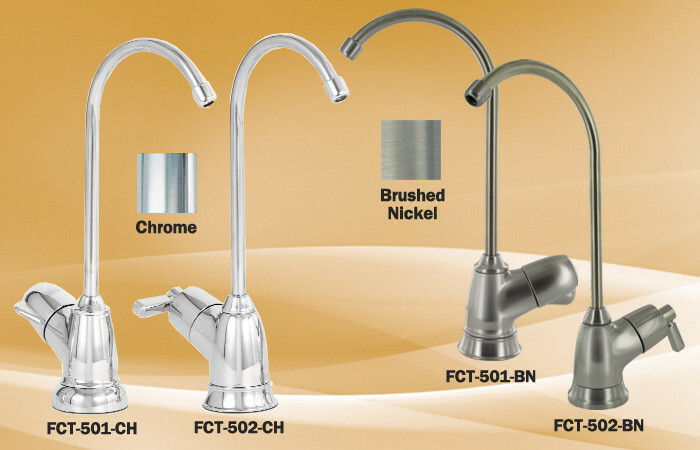 501 and 502 Series Non Air Gap Drinking Faucets | The FCT-502-CH faucet is included in the TL3 Ultrafiltration Kit. Faucets have been certified to meet NSF/ANSI Standard 61, offering a safe, quick, and easy way to dispense filtered water.